Walking home last Monday I took a detour past the Cathedral to have another look for the remaining five original, medieval statues. I was pretty sure that I’d found two on the northwest tower – one nameless woman next to Eve and another to the left of Deborah. The Victorian statues tend to have names on their pedestals. There’s an old photograph of the western front of the Cathedral pre-restoration on the English Heritage Viewfinder website, which you can see here. It shows the front looking strangely bare – above the row of kings only the niches containing the few remaining original statues are filled. 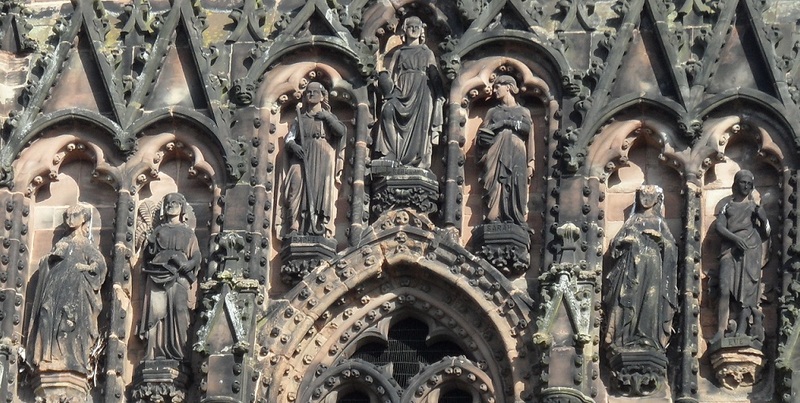 According to a comment someone left on here, there are other statues on the other side of the north west tower. Unfortunately, my timing wasn’t great as someone was cutting the grass alongside the tower and a Midlands Today van had not long pulled up nearby and were making preparations to film (I later found out they were there to cover the Olympic Torch route story). As I didn’t fancy making a cameo appearance, dodging the mower in the background of a news report, I took a hasty few photos of the tower and carried on around the back of the Cathedral. Stupidly, I didn’t check them before I got home and it’s not easy to make out much. Another trip is in order…. The medieval statue hunt continued as I walked around, in case one had sneaked in somewhere other than the northwest tower. I found Christopher Wren, Elias Ashmole and Dr Johnson amongst others along the way. “The world is not yet exhausted; let me see something tomorrow which I never saw before” said Dr Johnson. Most of the statues are accompanied by something symbolic – Johnson of course has his dictionary. It’s the same for the kings (e.g. William the Conqueror holds the Domesday Book) and the biblical characters (I knew nothing about Deborah, but according to wikipedia she was a prophet and a judge and delivered her verdicts near a palm tree which explains why there’s one behind her statue). I was wondering about Eve? Surely that’s an apple near her foot but what is she holding in her hand? Imagine if you someone was to create a statue of you and they had to sum up your life with an object or two! Just past Dr Johnson and his big, papery thing is another statue. She has no name and as far as I can see there is no clue to her identity. I’m speculating, but is this one of the many statues destroyed or defaced by the parliamentary troops during the Civil War? 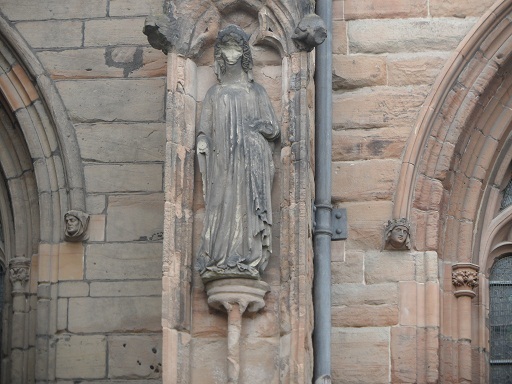 Most of the other damaged statues were removed – where did they end up I wonder? 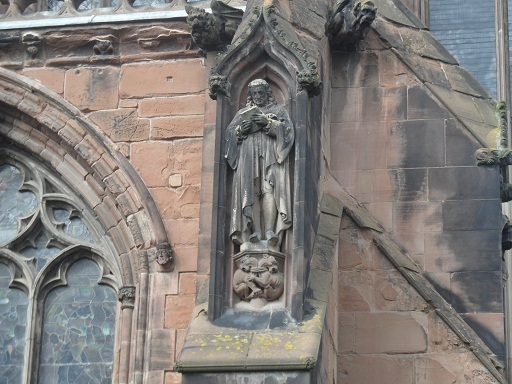 I came across some great photos of a figure of Christ on Aidan McRae Thomson’s flickrstream at a church in Swynnerton, Staffordshire together with an interesting theory that the statue originated from Lichfield Cathedral. If anyone else has any theories or even evidence of where the statues ended up, I’d love to hear them! I have to confess that for me, sometimes the Cathedral is just there, part of the scenery as I go about the city. However, there are other times when, either by chance (catching the light a certain way) or by design (medieval statue hunting), the Cathedral commands my full attention and once again, I am reminded of what an incredible building this is, and the skill and talent of the craftspeople who made it so. A couple of weeks ago, I’d have said without hesitation that I knew this story. Lord Brooke was shot through the eye and it was John Dyott (or Dumb Dyott as he was known) with a musket from the central spire of the Cathedral. It’s possible that this is the correct version, but as I know now, it’s certainly not the only version. According to a letter from Richard Greene2 the version he based the inscription on was from Sir William Dugdale’s 1681 book ‘The Late Troubles in England’. Greene believed this gave the most ‘circumstantial account of the affair’. Over in the comments section of the Shopping Daze post, Pat & Ian have been discussing the affair, following a comment left by ‘Born a Lichfeldian’. In arguing their case, Pat & Ian have both done some research – Ian has found these different accounts on the Learning with Archives in Staffordshire & Stoke on Trent website and Pat has found a programme that includes a section about John Dyott. The fact that Brooke was killed on 2nd March doesn’t seem to be in dispute but inevitably, with this date being St Chad’s day the significance attributed to this does differ. 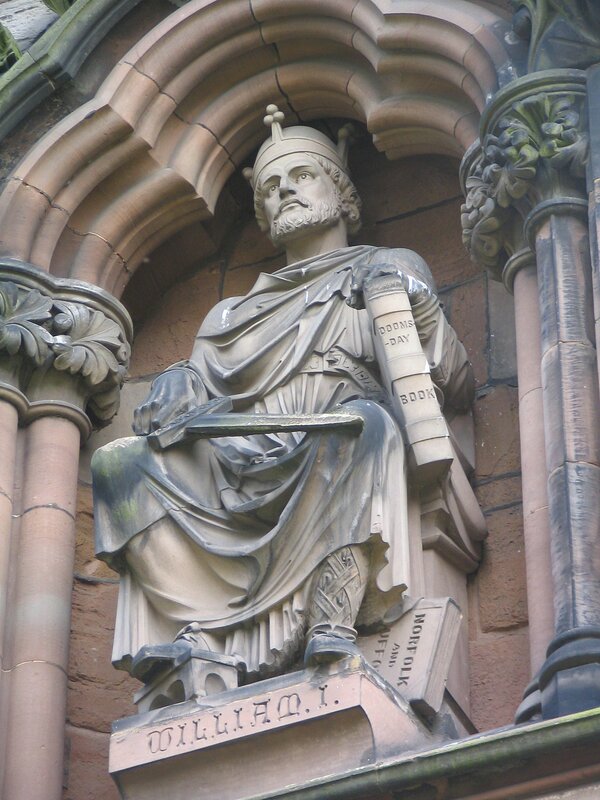 Some, like Archbishop Laud suggested that St Chad had a hand in events….. So, let’s imagine there was a way to prove exactly what happened on 2nd March 1643 (yes, I’m still thinking about my reconstruction idea!). What would we gain and what would we lose by doing so? I can’t add any new photos so I can’t provide one of Brooke House. How about walking a few of those mince pies off with a stroll up Dam St to have a look for yourself? 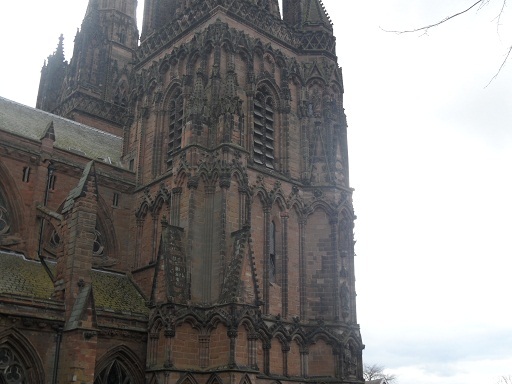 Following on from yesterday’s google doodle of the Midland Grand Hotel at St Pancras, to to commemorate the 200th birthday of Sir George Gilbert Scott, I had a quick look at Scott’s connections to Lichfield. Scott was the Lichfield cathedral architect from 1855 to 1878, first restoring the interior of the Cathedral and then working on the exterior, including the West Front which had been vandalised during the civil war and covered in roman cement in an earlier restoration.You can read more about the restoration at the Lichfield Cathedral website. It seems Lichfield Cathedral isn’t the only city building that Sir Gilbert Scott was involved with. In the early days of his career he had formed a partnership with his former assistant William Bonython Moffatt. The Scott & Moffat practice made workhouses their speciality. Apparently, they would monitor the newspapers for adverts by Poor Law Unions looking for architects to build their new workhouses. Scott & Moffat answered an advert placed by the Lichfield Workhouse Board of Guardians, looking for “Plans and Specifications for a Workhouse to hold two hundred Paupers, in accordance with Mr Kempthorne’s Model.” Scott & Moffat were eventually selected after much deliberation by the workhouse guardians and work began on the tudor style building on 24th May 1838 and it was officially opened on 8th May 1840. Their work can still be seen at the old St Michael’s hospital on Trent Valley Rd. Scott and Moffat parted company in 1845, after designing around 40 workhouses together. Scott’s wife Caroline Oldrid was said to have put an end to the partnership, as she believed that Moffat had become unreliable. In 1860, Moffat was was imprisoned as a debtor. After their partnership ended, Scott carried on with his two sons as his assistants. His younger son, John Oldrid Scott took over his father’s practice in 1878 and was the architect overseeing the restoration of the cathedral spire in my previous post! I was reading his notes and letters to the Dean and Chapter just a few days ago (his handwriting is terrible!). Scott’s eldest son George died at the age of 58, strangely enough at the Midland Grand Hotel at St Pancras Station. Scott was knighted in 1872 but faced some critiscism during his career. William Morris and others founded the Society for the Protection of Ancient Buildings in 1877, in response to what they felt was the unsympathetic restoration of medieval buildings by Victorian Architects, Scott amongst them. Apparently on Scott’s death, Morris described him as ‘the happily dead dog’. The Midland Hotel was threatened with demolition in the 1960s, but The Victorian Society campaigned and the hotel became grade I listed. The hotel was reopened earlier this year as the St. Pancras Renaissance Hotel. You can see a list of the buildings Scott worked on here. 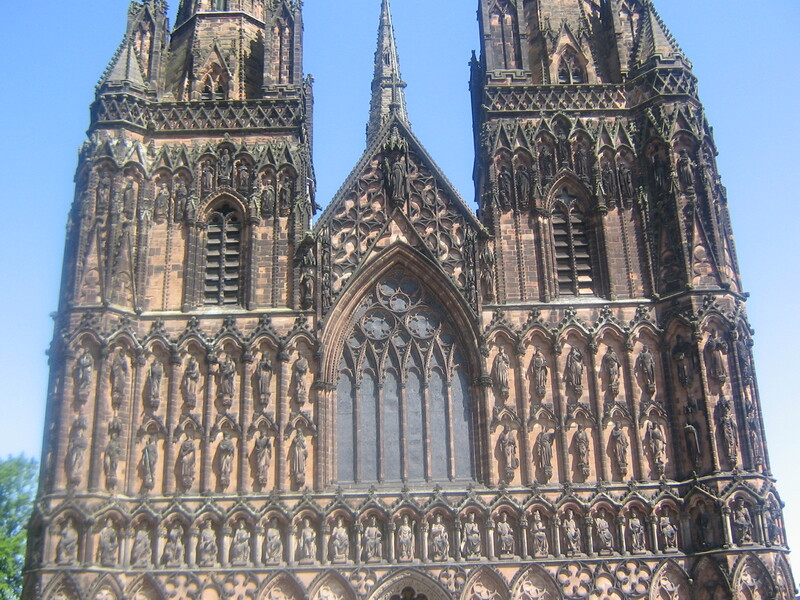 I’m pleased to see that they’ve included a picture of Lichfield Cathedral!